Spring is here and so is the Quiche and Flan season. There is something about serving a Quiche in winter that doesn’t seem right. It’s a summer dish – maybe it’s because of the sunny yellow that comes through from the eggs and cheese or maybe because its best suited to serve with salads, I just don’t know. Quiche in winter just seems so wrong. Neither do I know which title to give my little dish, is it a Tart, Flan or Quiche? 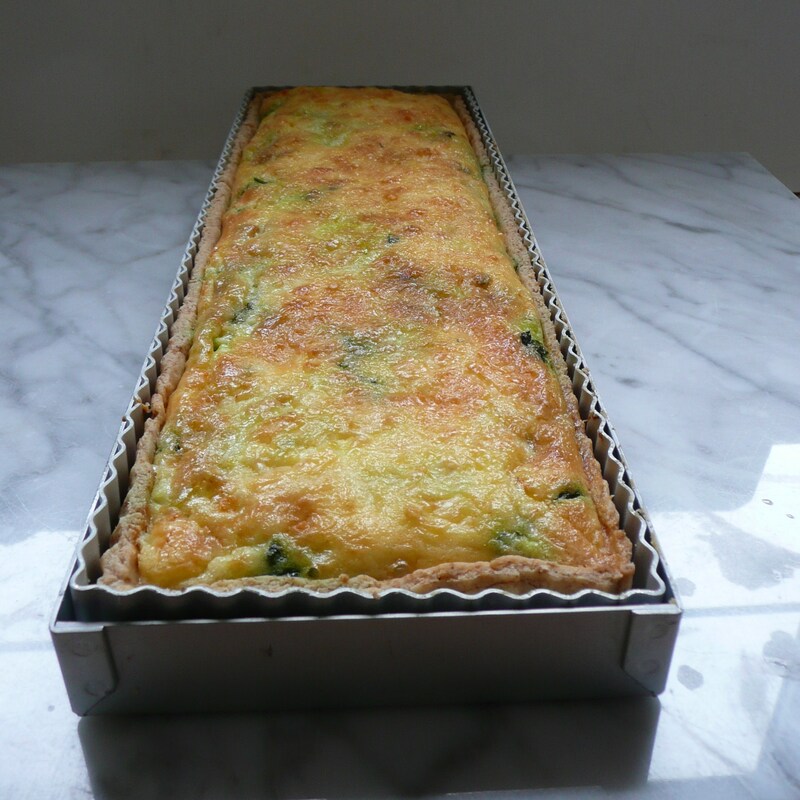 Quiche is so easy – I always seem to forget this little fact. I have made the pastry in the morning, lined the tin with it and left it in the fridge until the evening when I have taken it out, blind baked while making up the filling. The added bonus it can be eaten hot or cold so another meal is taken care of for the following day. I have also taken it on picnics – the secret being to keep it in the flan dish so it doesn’t break up in transit. My method is to throw into a food processor the flours, salt, butter and lard and whizz for a minute. If the mixture does not resemble fine breadcrumbs whizz again for 30 seconds and check again. Add the Parmesan and give a ten second whiz to mix. Add the egg yolk and a little iced water (I used 2 small tablespoons) and whiz again until it forms a ball in the processor. Roll out onto a floured board and line a 8 inch flan dish. Push the pastry into the fluted edges of the dish. Prick all over the pastry with a fork and place in the fridge for a minimum of 30 mins. Longer is better. Pricking the bottom and sides with a fork will prevent it from bubbling as it bakes. It’s not the end of the world if the flan dish is 7 inches or oblong in shape. The fabulous thing about pastry is that if there is any left over that would be enough to make a small tartlet; wrap it in a freezer bag and place into the freezer and use when needed. When the pastry has had the required rest, remove from fridge and line the flan with greaseproof paper or foil and weigh down with dried beans and cook for 12-15 mins at Gas mark 5/190C/373F. Take out and remove foil/greaseproof paper and beans and put back in the oven for another 5 mins. Then melt the butter in a pan and add the onions and cook for 5 mins not allowing them to burn. Stir in the watercress and cook for 2 mins until wilted. Beat the eggs and soured cream together; add the cheese salt and pepper. Spoon the onion and watercress into the flan, you will need to use a fork to spread out the mixture evenly then pour over the egg mix and return to the oven for 20-25 mins until golden brown. I love to eat this when it’s cooled. I have also found that if I put it in the fridge after its got cold the pastry tends to tense up and becomes a little bit firm. So I tend to eat it within 24 hours and try to avoid putting it in the fridge. I adore watercress, but have yet to make a quiche with it. Yours is very appealing. Thank you. The quiche really compliments the watercress and this is quite a light dish.